Here is a question for you – how do you sell someone on the fantastic view from the 49th floor of a new condo project before construction has even begun on the building? How do you show what the view will look like in every direction from each of the units on that floor and on each and every other floor in the building? Drone 360 PreViz – that’s how! DroneBoy is getting asked to do this type of thing all the time. These days we are deploying our highly-specialized teams to new condo construction sites almost weekly. When we arrive on site we can fly and capture 360-degree photo montages and now 360-degree video from various heights all the way up to the penthouse floor (or where the penthouse will soon be). These flights are easy for us to do because there is no building on the site yet and the project is usually just a big hole in the ground at this point. Construction sites are almost always fenced off from the public so this works really well. 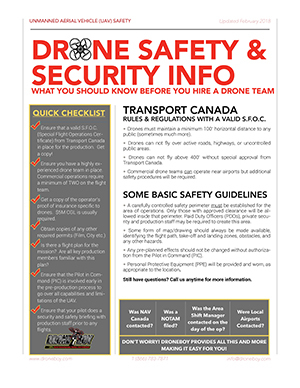 The fences gives our drone team the natural security perimeter that we require for commercial flight and the freedom to fly safely without the worry of perimeter incursions. When we get the captured media back to the office we can create 360 degree seamlessly stitched photo panoramas and/or video final output files OR we can hand our source files over to the developers advertising team so that they can do the post-production. The final panoramas and 360 videos can go directly into presentations and project web sites.